Since the beginning of the conflict in Syria over two years ago, refugees have been entering daily into neighboring Egypt, Iraq, Jordan, Lebanon and Turkey. 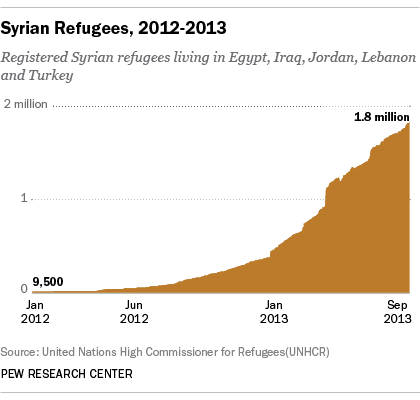 An average of 6,000 refugees have crossed into neighboring countries since the beginning of 2013. At the beginning of September, over 1.8 million refugees were registered with the United Nations’s High Commissioner for Refugees (UNHCR). With about 200,000 additional refugees awaiting registration with UNHCR, the number of refugees is about two million. About half, or one million refugees, are children under 18 years of age. Equal numbers of men and women have left Syria. The scale of departure from Syria is similar, yet different to other recent conflicts. About 1 in 10 Syrians have left that country in the last two years, the same proportion as Iraqis who left Iraq when the flight of refugees was the highest in 2007. However, the movement of Syrians is not as great as Rwanda where nearly 4 in 10 left during the height of the Rwandan genocide in 1994. The greatest number of refugees have gone to Lebanon (about 700,000) while about equal numbers have gone to neighboring Jordan (about 500,000) and Turkey (500,000).